Embattled Japanese conglomerate Toshiba on Thursday said Chinese regulators have given approval for its plan to sell its prized chip unit—the final hurdle to complete the deal. Toshiba agreed in September to sell its memory chip business to a consortium led by US investor Bain Capital, which was seen as crucial to keeping it afloat after multi-billion-dollar losses. But finalisation of the deal had been delayed as Chinese authorities suspended their approval, checking if the sale could violate the nation's anti-trust law. 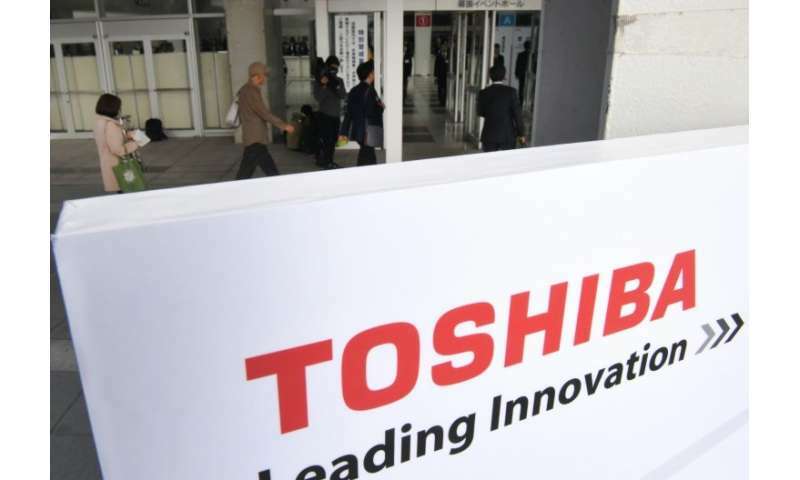 "All required anti-trust approvals have been granted," Toshiba said in a statement. "All conditions for the closing of the transaction are now satisfied," the firm said, adding that it plans to complete the deal on June 1. The Bain-led group acquiring the memory chip business includes US tech giants Apple and Dell, as well as South Korean chipmaker SK Hynix. Toshiba has struggled after the disastrous acquisition of US nuclear energy firm Westinghouse, which racked up billions of dollars in losses before being placed under bankruptcy protection. In order to survive and avoid delisting, the cash-strapped group decided to sell its chip business—the crown jewel in a vast range of businesses ranging from home appliances to nuclear reactors. On Tuesday, Toshiba said it had bounced back into the black after a disastrous year and will avoid a humiliating delisting from the Tokyo stock exchange.